"Crowds at the port, embassy, UN and airport are getting bigger and more rowdy each day as people become more desperate..."
Crowd gathering outside US Embassy. Crowds at the port, embassy, UN and airport are getting bigger and more rowdy each day as people become more desperate about the basic necessities. We are working tomorrow assisting getting 70 trucks of supplies moved into the city. 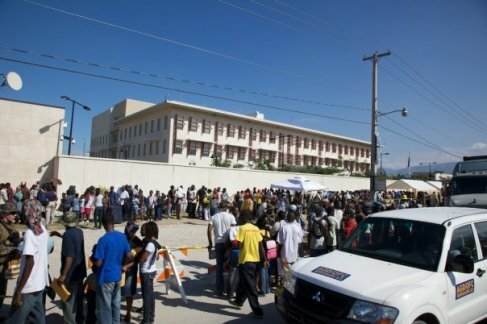 Haitian Supreme Court, where the country lost many judges and some of its top lawyers. Because of decomposing bodies you can smell it a block away--lots of lives lost here. This was originally a 5-story supermarket with dozens if not hundreds of people inside when the quake hit. The smell told us that this was definitely the case. Early wake up call at PAP airport by a 6.1 quake 35 miles away. Dead sleep to dead run in less than a second! What better way to get adrenaline flowing in a.m. than a 6.1. 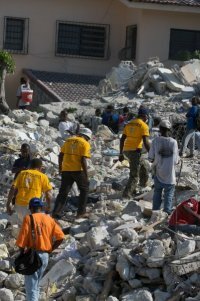 In the rubble of the inner city of Port-au-Prince with the Volunteer Ministers caring for people, helping at dig sites. Went on a successful recovery Mission to retrieve small boy and his mother stuck inside a refugee camp. Just established a new HQ at the airport in the Tent City with all the other NGO's, right between Russa and Netherlands teams. Beautiful night by the runway at PAP. 2:35 a.m. and still see 4-5 planes lined up for approach.